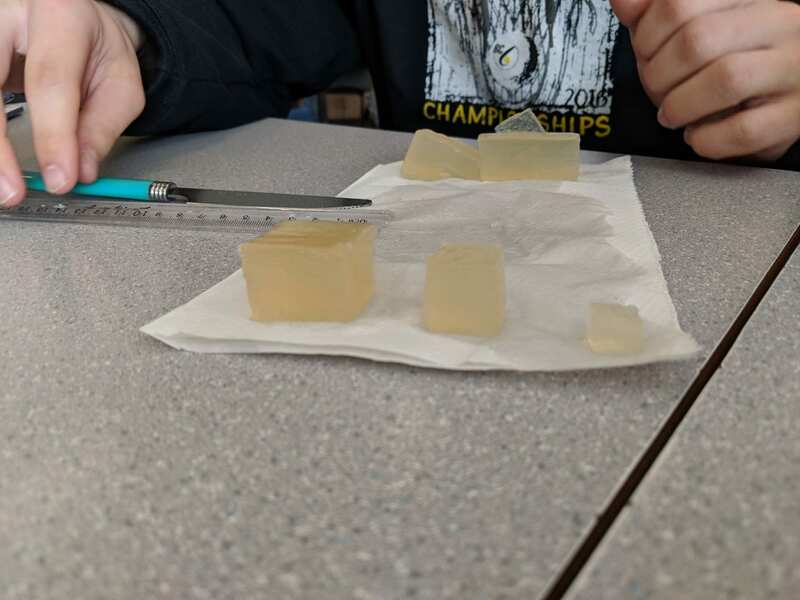 Hypothesis: The size and volume of the agar cubes are what affect the diffusion, so the bigger the cubes, the less it will diffuse because it takes a longer time to get through the dimensions of the cubes. 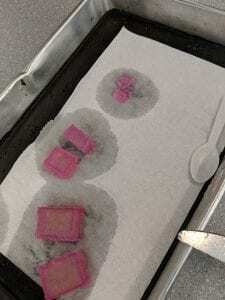 In terms of maximizing diffusion, what was the most effective size cube that you tested? I would say the smallest cube we tested, the 1cm one was the most effective because it had a diffusion of 75% and had very little agar left that was colourless. 2. Why was that size most effective at diffusion? What are the important factors that affect how materials diffuse into cells? The smaller cube was most effective at diffusion because it had a smaller amount of surface area and the base was able to absorb it faster. 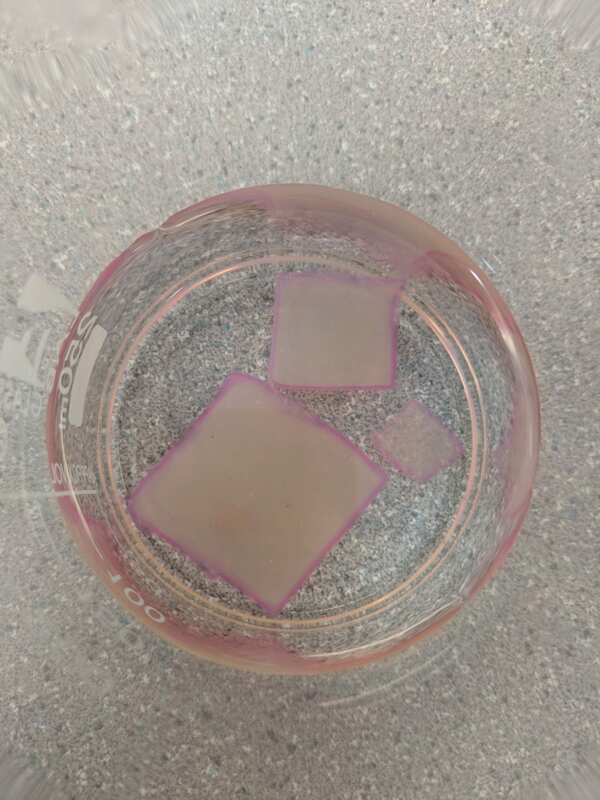 It has the smallest amount of volume so it was able to get to the middle much quicker and important factors include the temperature of the base and agar, the surface area and volume as well. 3. If a large surface area is helpful to cells, why do cells not grow to be very large? Surface Area is an important aspect for cells but having a low volume is as well because having a greater surface area helps more materials enter but having a low volume allows them to get to the centre much quicker. If cells were to grow, their volume would increase at a greater rate than their surface area and that would make the diffusion less effective. 4. You have three cubes: A, B, and C. They have a surface to volume rations of 3:1, 5:2, and 4:1 respectively. Which of these cubes is going to be the most effective at maximizing diffusion, how do you know this? The most effective cube would be cube C, 4:1, because the surface area to volume ratio is the highest and it has more area for the material to diffuse but the lower volume helps it travel faster. 5. How does your body adapt surface area-to-volume ratios to help exchange gases? Our bodies have a circulatory system and organs to help move materials in our body and our bodies are able to make cells longer but thinner to reduce the volume but make it so they have more surface area. 6. Why can’t certain cells, like bacteria, get to be the size of a small fish? Bacteria are single-celled and since cells are more effective with a lower volume, so being smaller wouldn’t help the functions of it. 7. What are the advantages of large organisms being multicellular?